US based Paragon Wireless recently released the world’s first SIP-Based Windows Mobile 5.0 dual-mode handset, the hipi-2200. 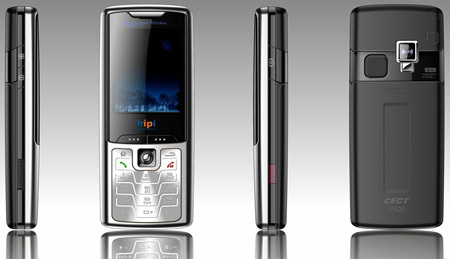 The hipi 2200 is a next generation dual mode phone utilizing VoWlan/ GSM dual-mode voice technology. What makes the hipi different from other dual-mode phones, is the Windows Mobile 5.0 operating system. The Windows Mobile 5.0 OS expands the usability and functionality of the phone making it more then “just a phone” allowing user to access the Internet and send/recieve emails. In addition to dual-mode voice calling and data transfer, the hipi 2200 features a built in 2.0M pixel camera, the MP3/MP4 player, and a camcorder. The hipi 2200 gets up to 4 hours of talk time, or 100 hours of standby. According to Ilkka Pouttu, Vice President of Sales and Marketing for Paragon Wireless, Ã¢â‚¬Å“the hipi-2200 changes the way enterprisesÃ¢â‚¬â€and individualsÃ¢â‚¬â€communicate with each other. Organizations can immediately measure their ROI, while workers can access all the information they need from one handset. The hipi-2200 joins our product line as a result of our commitment to dual-mode product development, our experience in the handset market, and our continuous improvement to dual-mode technologies such as FMC features, security, power management, roaming, and over-the-air management of handsets. Paragon is able to offer a family of dual-mode handsets which are cost-effective technology leaders,Ã¢â‚¬Â said Pouttu. There is currently no information on MSRP or when the hipi 2200 will be available. It will be interesting to see when cellular carriers, wireless carriers, and VoIP providers will decide to support seamless mobility for all of the dual-mode phones that have come out recently. For the business user, as Pouttu remarked below, the ROI of carrying one handset that leverages the best of all communication technologies is not only immediate, but extremly compelling. Unfortunately, “making it work correctly” (as no carrier in the US currently supports seamless handoffs between GSM and VoIP) is not an easy undertaking for the majority of businesses, which therefore dilutes its present effectiveness. previous post: Free VoIP Service For a Year!